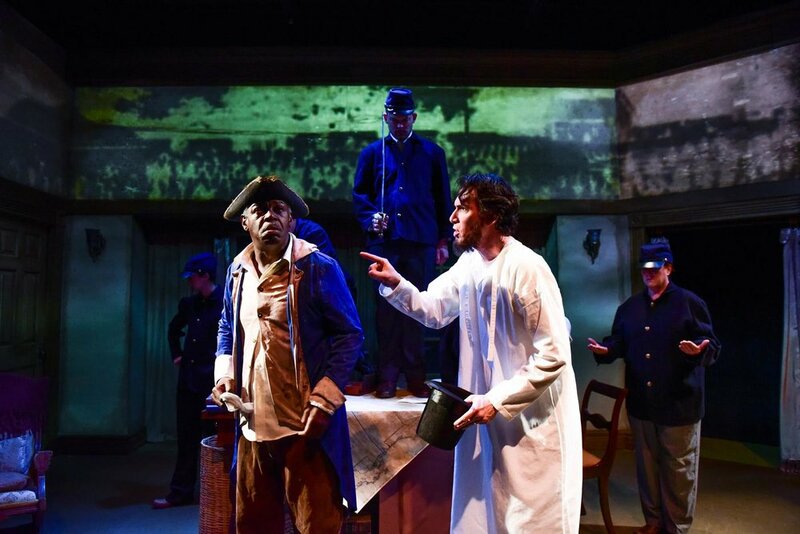 Shattered Globe Theatre launches is 2017-2018 season with the Chicago premier of Pulitzer Prize nominee James Still’s The Heavens Are Hung In Black and directed by SGT Ensemble member and twelve time Jeff nominee Louis Contey. Still’s work examines the United State’s 16th president in a personal interpretation of the five months between the death of Lincoln’s young son, Willie, and the signing of The Emancipation Proclamation. Playwright James Still is a two time Pulitzer Prize nominee and has multiple award winning plays with international recognition. 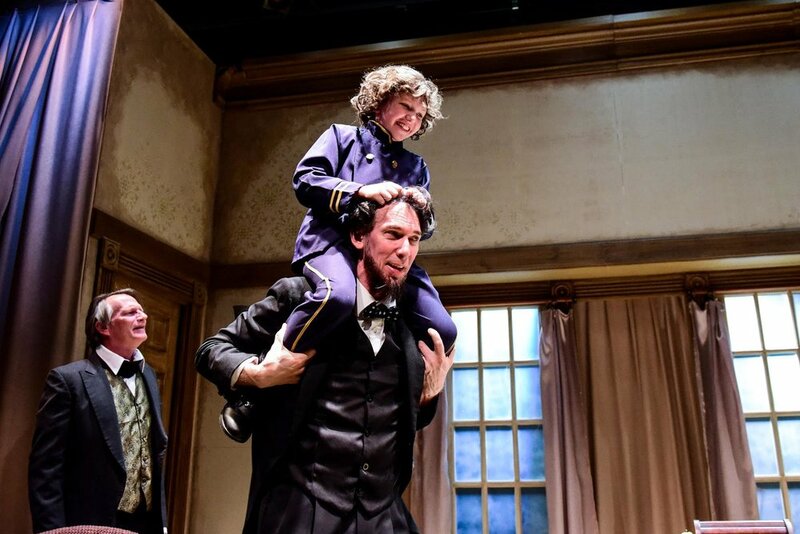 The Heavens Are Hung In Black was commissioned by and premiered at the newly reopened historic Ford’s Theater in 2009; the same theater where Lincoln was infamously shot in 1865. Still's use dynamic syntax gives great depth to the historical truth and contextualizes the dramatized trauma of the death of a loved one. Illustrated on stage is a president suffering from insomnia and plagued with the strain of leadership in a time of grief. Lincoln struggles with unbearable personal, political and historical pressures, as the Civil war lies heavy on his shoulders. With a big shoes to fill, Lawrence Grimm bravely embodies the 16th president in a truly captivating performance. The multidimensional man is even reflected down into the physical blocking done by Grimm. Every time Grimm sits down the long limbs are being directed in particular ways to convey relaxation, reflection, or stressful contemplation. These small detail in mannerisms tell the audience how to read the moment without a word being uttered. Against the background of the large oval office with bay windows, Grimm stands out tall against Angela Weber Miller’s scenic design. The intimate theater space leaves the three front rows feet away from the tri-angled stage. Kerosene styled lights edge the downstage and mixes the historical theater element with the dramatized 1863 White House. The large scale bay windows act not only as mimics to the famous windows of the oval office, but also are utilized as entrances and exists to figuratively represent ghosts and the dream realm. Windows have been considered one of the many portals to the spirit world and hold spiritual paranormal energy in a similar way to mirrors and other reflective surfaces. During the 1800s, the rise of social interest in the paranormal is a critical element in understanding the historical background of this play. Mary Todd Lincoln was an avid believer in the spirit world, which lead to her own delusions and obsessions. Linda Reiter’s portrayal strongly harnesses the humanity in Mrs. Lincoln’s mourning and the overwhelming anxiety of having a politically controversial husband at the center of the war. Reiter is a founding ensemble member of Shattered Globe Theater and most her recent portrayal of Queen Elizabeth in Chicago Shakespeare Theater’s production of Shakespeare in Love, whom could not be more opposite of Mary Lincoln. One holds the power of an entire monarchy at her fingertips, while Mary Lincoln, although highly esteemed, is broken by the loss of her son and struggles to navigate a world where she seems to have lost all power. Both, Grimm and Reiter, are highly skilled actors in their craft and the pair illustrate the vast range of grief in difficult times. The play hinges not only on the adversary influences of Lincoln through his insomnia caused hallucinations, but other important literary figures. Walt Whitman, depicted by Tim Newell, makes an appearance narrating the traumas of war by reciting his poems or fictionalized monologues. Whitman’s poem “Beat! Beat! Drums!” was a patriotic rally call for the North near the beginning of the war, but soon Whitman’s work transitioned into mournful reflection. This was due to Whitman’s various part-time jobs in the government army offices leaving time for him to volunteer as a nurse in the army hospitals. He learned first hand accounts and the trauma and tragedy that brought young men to those hospital beds. Another prominent author mentioned is Harriet Beecher Stowe and her novel entitled Uncle Tom’s Cabin. This focus on literary history exposes how words navigated and changed the world. The power of though put to paper is the foundation of many of the truths we hold as Americans in present day. The sound design by Christopher Kirz will leave you jolted by Lincoln’s dreams of debates with his famous adversaries and the whispering of unnamed soldiers. The canon fire echoes in the halls of the White House and the first family are the ones hearing it. Dreamlike sequences of projections and light create a visually striking effect. History is brought to life in a haunting beauty. Michael Stanfill’s lighting and projection design is wonderful! Three projectors hang on the grid above each pointed to the angles of the three cornered stage. The first cue holds a spotlight on the upside down tall black top hat sitting in the middle of the oak desk. Additionally a powerful moment that was made possible by the lighting design was the directional under light built into the top left corner of the desk during the Dread Scott recitation of Lincoln’s debate speech in ’58. This stylistic moment is key in adding the drama to the words as the character stands on the desk as if upon a soap box. Darren Jones portrays Dread Scott, Theophilus Hammond, Uncle Tom, Butler, Janitor and 21st Century Man. Casting a single person to portray a variety of individuals was powerful choice. Some characters have strong voices and outspoken opinions, while others move through life silently, but no less animated. A strong ability to encompass the diversity of characters and bring them to life is lovely to watch. Jones is a stunning master at being able to convey not only the dramatic dialogue of vocally strong characters, but well projected physical reactionary acting of those characters in the work not allowed a voice. Many beautiful imagery and play on words with some of Jones’ characters in regards to the racial and political tensions of the time, particularly that Uncle Tom and Uncle Sam need to have a chat. How extremely well put! Jones is Artistic Associate at Shattered Globe Theater and celebrating his 25th season in theater. A stunning performance and a hearty congratulations! Theater has a beautiful way of illustrating the problems we are experiencing in our own present lives either by comedy or tragedy in imagination or history. It dramatizes reality and has a way of cropping up themes that speak to audiences at the perfect time. The Heavens Are Hung In Black boldly presents the idea that often when we are so consumed by all the various small issues that we become blind to the matter at heart. 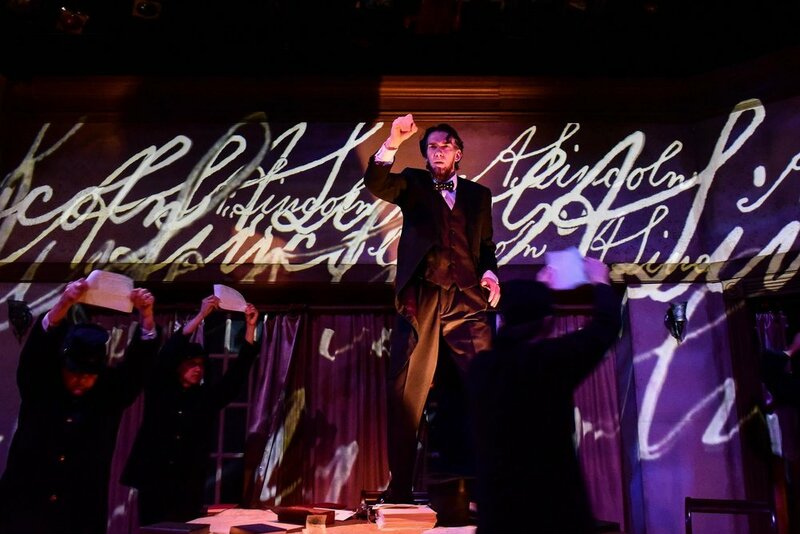 This performance reveals Lincoln’s imperfections and humanity and explores the conscience of a man who led America in a war that we are still fighting to this day. With a little perspective, we may just come away with more than just a history lesson. The Heavens Are Hung In Black is now playing at Theater Wit, 1229 W. Belmont Ave, through October 21st, 2017. Tickets are available through www.shatteredglobe.org, by phone 773-975-8150 or in person at the Theater Wit box office. Darren Jones and Lawrence Grimm with the cast of Shattered Globe Theatre’s in THE HEAVENS ARE HUNG IN BLACK. Photo by Evan Hanover. Don Bender, Leo Sharkey and Lawrence Grimm in THE HEAVENS ARE HUNG IN BLACK. Photo by Evan Hanover. Lawrence Grimm and the cast of Shattered Globe Theatre in THE HEAVENS ARE HUNG IN BLACK by James Still, directed by Louis Contey. Photo by Evan Hanover.